elementary school, destroyed by fire in 1974.
survives today as 1-2 Church View. Reproduced courtesy of Kate Rundle. 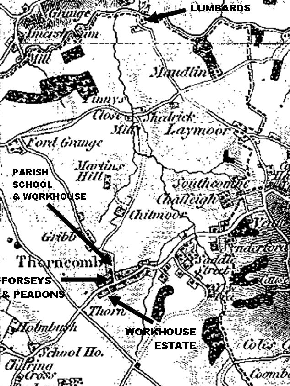 Detail from 1811 OS Map showing location of Thorncombe's parish workhouse and poorhouses. © 2004-2015 of the Great Britain Historical GIS Project and the University of Portsmouth. In a nutshell the Workhouse Test Act (Knatchbull) 1722 required Vestries (from which today's parish councils evolved) to set up parish workhouses to compulsorily house able bodied paupers. The idea was that these 'Houses of Industry' would generate sufficient income to relieve the strain on the public purse. Money was spent on doing up Forseys, Peadons and Lumbards, which were probably being used to house the elderly, sick and infirm, but it seems they weren't big enough. So in 1724 work began on modifying the house on the corner of Witty's Lane and High Street then known as Ousleys. (v) This was the house which later became Workhouse Farm, then more recently Higher Farm. However the fly in the ointment was the death of leaseholder William Ousley in 1727. 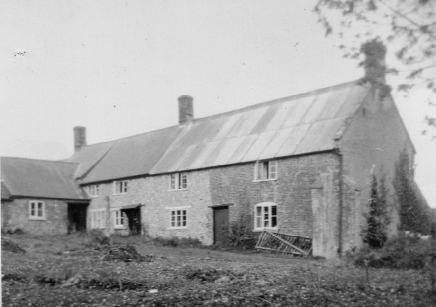 Rear view, Workhouse Farm circa 1955. It was rented by the parish from William Ousley in 1725 for use as the parish workhouse. Reading between the lines, William Ousley's death led to the reversion of the lease for Ousleys to the Sadborow Estate which owned the freehold. It seems owner John Bragge Esq was reluctant or perhaps couldn't afford, to give the property to the parish for use as a workhouse. The Overseers of the Poor accounts record how he gave the Vestry a breathing space to sort itself out while continuing to draw rent. Reproduced courtesy of Dorset History Centre and with the kind permission of Thorncombe Parochial Church Council. 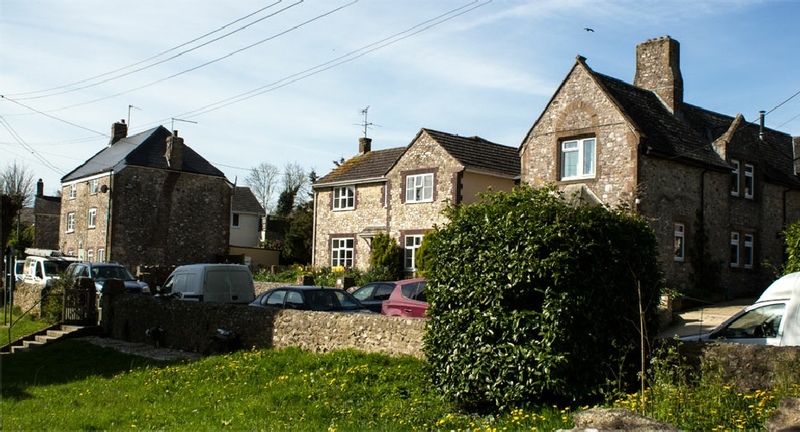 Thorncombe's able bodied paupers were then sent to Axminster Poor Law Union Workhouse. The parish workhouse was therefore now redundant. Split into two houses, it survives today as Church View. Number 1 was pressed into use as a parish room for 'paying the poor, penny readings and vestry Meetings', and number 2 was rented out. In 1874 the schoolroom, which stood on the site of where Wellstone House and School House are today, was demolished to make way for the new elementary school. It too burnt down in 1974 but the schoolmaster's house survived. The former parish workhouse was sold by the Vestry for £110 in 1875 to help meet building costs for the new school and so far as can be ascertained reverted to and has remained in residential use up to the present day. Church View above is the house on the left. (i) J. Ede, Thorncombe. 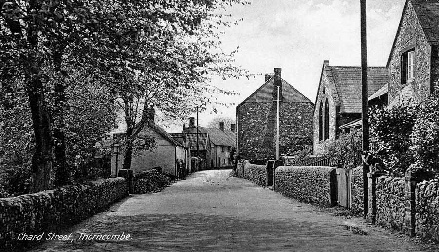 A Village History (unpublished t ypescript) (1982); R. Farley, Thorncombe Life Memories and the History of the Parish (1995), 38; E. Retter, 'Thorncombe Workhouse' in The Dorset Year Book (1957-8), 117-118; A. Shipp, Poor Relief in Thorncombe 1722-1809 (2013), 20-22. (ii) G. Andrews Moriaty, 'Additional Records Relating to the English Ancestry of the Bowditch Family; D.H.C., PC/THO/ 3 Thorncombe Parish Council. Overseers of the Poor ; T.N.A. CHAR 2/67 Records of the Charity Commissioners and Charity Commission. Commission for Inquiry into Charities: Papers. Devon ... Thorncombe; ED49/1785 Department of Education & Science. Elementary Education Endowment Files. Thorncombe Church of England School a) Reverend Thomas Cook and Elizabeth Bragge b) Girls School, 1872-1907; Somerset Heritage Centre DD\TOR/ 112 Winsham Deeds, 1647-1776. (iii) T.N.A., MH12/2095/176 Sale of Parish Property Form 8 … Thorncombe Parish Workhouse. (iv) Ordnance Survey, First Series, Sheet 18, scale 1:63360 (1811) on-line at www.visionofbritain (accessed 14.03.2017). (v) D.H.C., D-MHM/8989 Thorncombe. Lease of cottage in reversion ... 28 Feb 1735. (vi) D.H.C., D-MHM/9098A, abstract of title of Thomas Newman to lands in the parish of Thorncombe, 1734-1840. (vii) B.L., Add. MSS. 9427, Lysons Notebooks, Letter from Charles Egerton,Vicar of Thorncombe to Samuel Lysons, Topographer, dated 11 January 1821, 116. 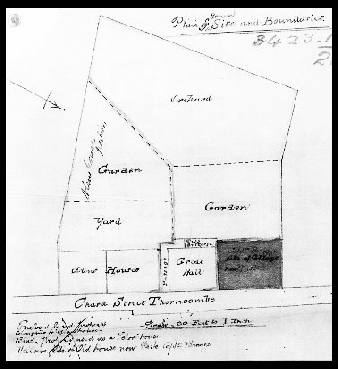 (viii) D.H.C., PE-THO/SC/8/3 Draft for a conveyance relating to the building of a school in Chard Street with plan. 1873.